The shared freehold experience is a common fixture of Brighton & Hove life which sees leaseholders both planning and paying for the maintenance of their most expensive assets. Historic buildings often suffer though simply because there is not the expertise, drive or willingness available to ensure that works take place. Ventnor Villas in Hove was built from the 1850s and features several buildings of note. No. 28A, Newport Lodge, stands out for its yellow-brick double-fronted façade alongside taller, rendered, townhouses. Like the road on which it stands, its name comes from a town on the Isle of Wight, in reference to Queen Victoria’s move to the island (after selling the Royal Pavilion and its contents!). 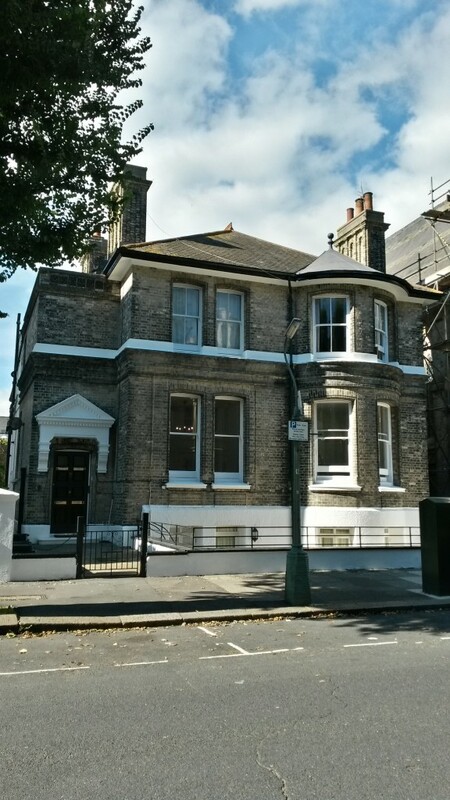 The three-storey Victorian villa was converted into five flats in 1962 (one in the basement, two on the ground floor and two on the first floor). Large rooms were chopped and fireplaces removed. 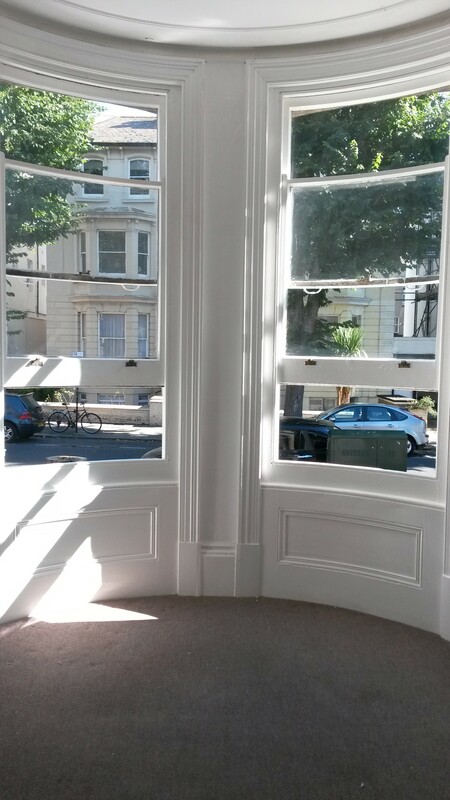 Lots of coving survives though, as do the original curved bay windows – complete with curved glass. The building’s leaseholders kindly showed me around, and helped me to solve a few mysteries. Several conundrums remain though like why the steps up to the raised ground floor are on the inside, how the basement was originally accessed internally, and what was in mind when the front garden was completely dug out to form the deep moat-like pit which separates house from pavement. Newport Lodge was built on land that belonged to the Reverend John Nelson Goulty, alongside what is now the United Reform Church, yet it was never the vicarage. The United Reform Church was founded as the Cliftonville Congragational Church in 1863 by a group from the Union Chapel in Brighton. Goulty was Minister of the Union Chapel and his name graces a local bus to this day. The fact that Newport Lodge was numbered ‘28A’ confirms that it was built after the rest of the street, probably during the 1880s. At Newport Lodge, things are on the up. A programme of works is now being discussed that should see all sorts of niggling tasks carried out, including the removal of layers of unwanted cables on the building’s façade. It is easy to forget that the building is probably worth more than £1,000,000 and that the approach to maintenance should reflect this. Not doing so is a false economy as anybody with a historic home close to the sea knows all too well.